Farm Credit Marketing Alliance visiting CA FFA State office in Galt. That support continues today, as Farm Credit associations in California together with CoBank, a national cooperative bank and member of the Farm Credit System, are collectively donating $250,000 over the four years ending in 2020. The grant will support the state FFA organization as it continues to expand its efforts and serve its more than 89,000 members. 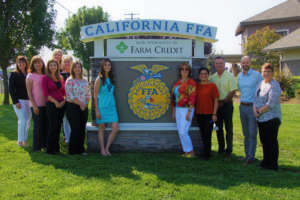 “A large part of our collective success at the local and state level is due to industry leaders like Farm Credit that continue to invest in the next generation, said Katie Otto, development director for the California FFA Foundation, the fund-raising arm of the organization formerly known as the Future Farmers of America. Leili Ghazi, president of CoBank’s Western Region Agribusiness Banking Group, said Farm Credit supports FFA so strongly because FFA students really are the future of farming in the Golden State. According to Otto, Farm Credit has contributed more than a half-million dollars directly to California FFA over the past 25 years and at least that much more in donations and assistance to the more than 330 local chapters in both urban and rural parts of the state. Keeping more than 50 leadership development conferences affordable for students, ensuring that despite family income, the students can attend and learn. And allowing FFA to construct a sign outside its 10-year-old headquarters in Galt, providing exposure to thousands of travelers a day passing by on Highway 99. Farm Credit staff getting ready to prepare BBQ for attendees of the CA FFA State Judging Finals at Cal Poly, San Luis Obispo. Farm Credit’s local support involves more than just donations. 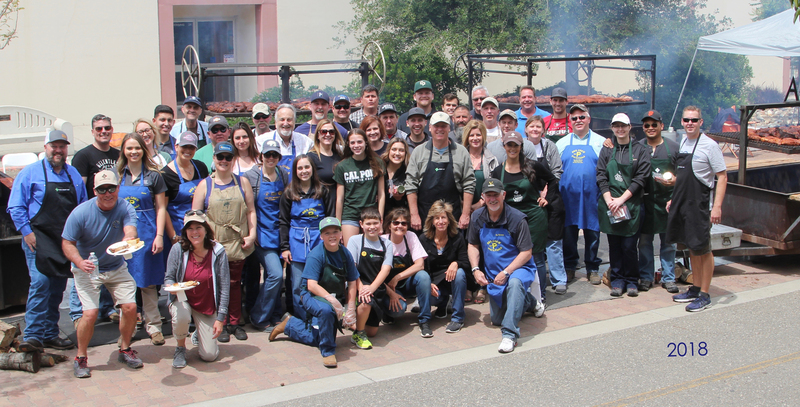 At the recent California FFA State Finals Competition at Cal Poly San Luis Obispo, Farm Credit donated approximately $14,000 to buy food for the end-of-year barbecue and employees of the local Farm Credit West branch did all the cooking. More than 2,500 students from across the state participated in the competition, competing in 21 events, including agronomy, dairy cattle, farm business management, marketing, veterinary science and welding. About the California FFA: California FFA serves more than 89,000 California high school students and strives to make a difference in their lives by developing their potential for premier leadership, personal growth and career success through career technical education.